Brilliant 5 bedroom holiday home sleeping 8 near All Rhone, Alps. A splendid holiday villa for an unforgettable family holiday, this property offers a private pool and has everything you"re looking for in a holiday home! On site parking. Satellite TV. Cot available. Airport within 1 hour. Pets not accepted. 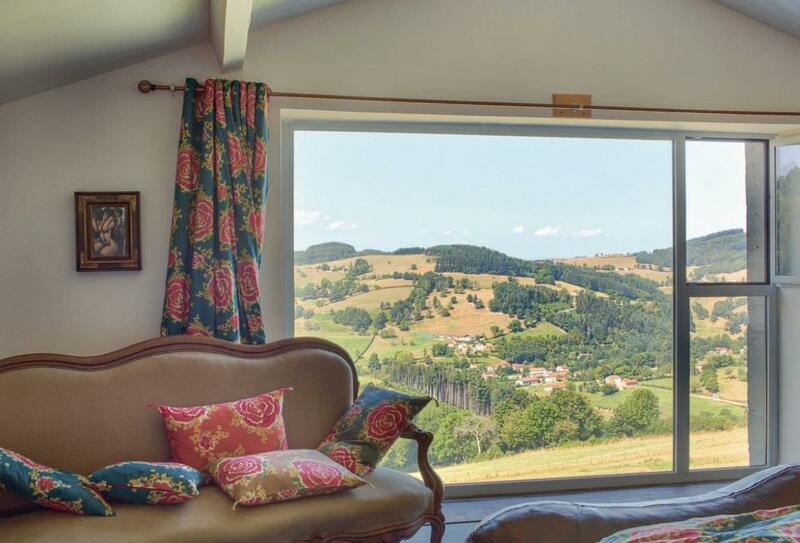 In the beautiful lush region of Beaujolais Hills and surrounded by nature, lies this beautiful and spacious stone holiday home which opens onto a charming, 2000m² garden. The property also boasts a large private swimming pool, three terraces and a roof terrace which offers a panoramic view. The property’s interior exudes an atmosphere of tranquillity and serenity, with large windows that provide a beautiful setting. The décor is a clever blend of contemporary, baroque and rustic styles. Ideal for walking, cycling or horse riding, the area also has medieval villages, the Canal de Roanne à Digoin and a world-renowned wine heritage. Villefranche-sur-Saone, 55km, has the Church of Notre-Dame-de-Marais and watersports and the nearest shop and restaurant are just 3km away. Garden, terrace, roof terrace, outdoor swimming pool (private, 52m², open Jun-Sep weather permitting), central heating, washing machine, dishwasher, microwave, freezer, satellite TV, DVD, CD/stereo, internet access, cot, table tennis, parking, garden furniture, sun loungers, barbecue. NB: Open-tread, spiral stairs to first floor. Steps and sloping banks in garden. External, open-tread stairs to roof terrace. Sorry, no hen or stag parties.